For some unknown reason, Manchester United are playing hardball on the transfer of Matteo Darmian away from Old Trafford despite the player’s desire to return to his home country and a number of clubs interested in his services. According to a stream of previous reports from Italy, the Red Devils appear set on making a profit on a player José Mourinho barely used last season, asking for around €20m, which has already put off Juventus. The Serie A champions could still be interested if that price drops later on in the transfer window, but other clubs might be prepared to pay up out of need, such as Napoli. 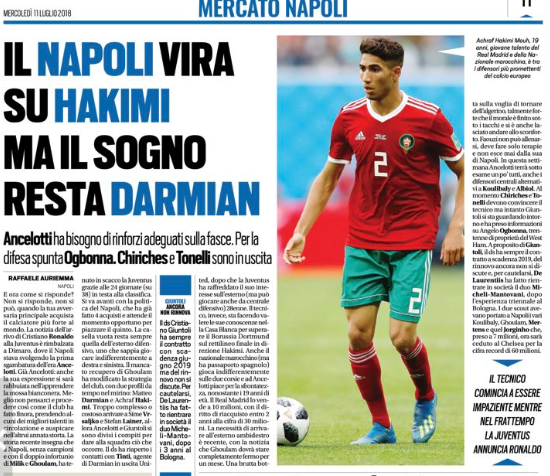 Carlo Ancelotti’s side have been linked here and there with the Manchester United defender, but Tuttosport’s latest report on the matter seems to suggest Darmian could quickly become their only option as other targets slip through their fingers. 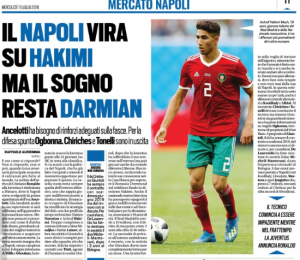 The Italian newspaper state deals for Sime Vrsaljko and Stefan Lainer are proving either too complicated or too expensive, meaning Matteo Darmian and Achraf Hakimi were the more realistic options. This was published early on Wednesday morning, and, since then, the latter of the two has been sent on loan to Borussia Dortmund for the next two seasons by Real Madrid. Could this be it? Could this finally be the beginning of the end of the Matteo Darmian saga?